Marking paragraphs: experimentally | type eh? Once again I have chosen five pages from the class assignment. It’s interesting that nobody asked me to define what I meant by experimental. But you’ll see in these examples that the text reads in a sequential fashion, from the first paragraph to the last. What makes them experimental is the treatment of the type. In this example a justified column of gray text is punctuated with a black dingbat, clearly indicating where a new paragraph begins. The heading is situated in plenty of space and even though it’s gray, it stands out clearly. 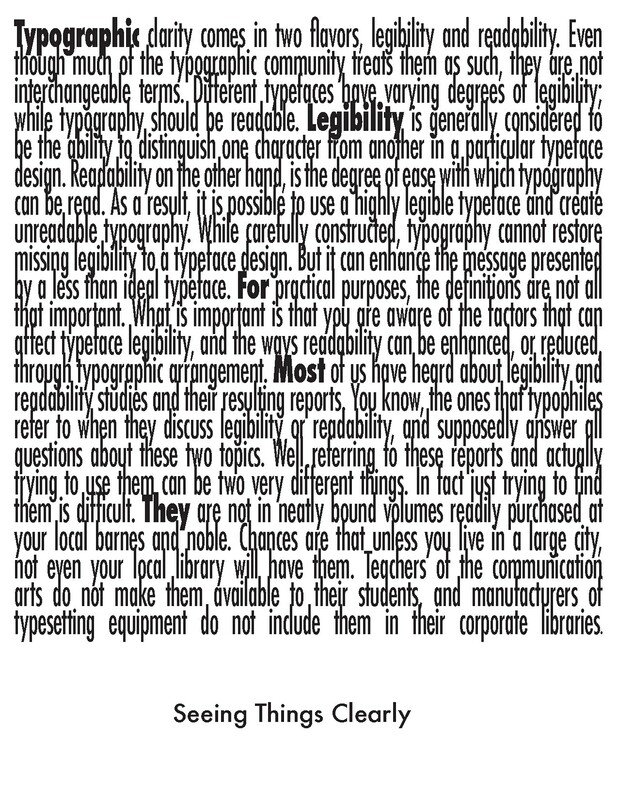 This design uses a dense block of text. The paragraphs are marked by a bold word at the start. In my view the design would be better integrated if the typeface for the heading had been the same as the text, Futura condensed. But the design approach is effective. 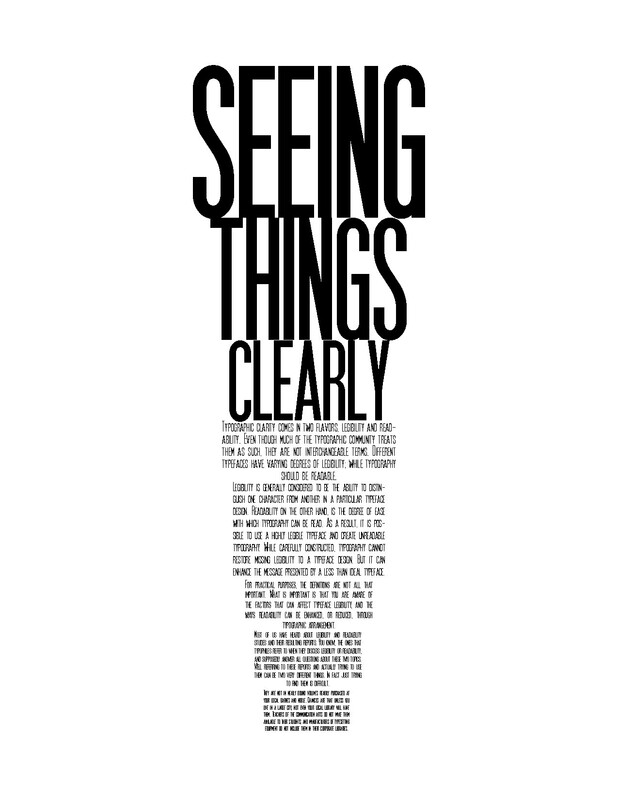 The composition cleverly demonstrates the meaning of the text: A legible typeface that has been made less readable by tight leading. I included this because the page is both an imaginative and well-crafted solution. As we discussed in class it does not mark paragraphs as clearly as it might, but that fix is simple. A really clever concept that also answers the assignment criteria. Fine work indeed. The simple but effective idea of reducing size and width is a good demonstration of a system being thoughtfully utilized. 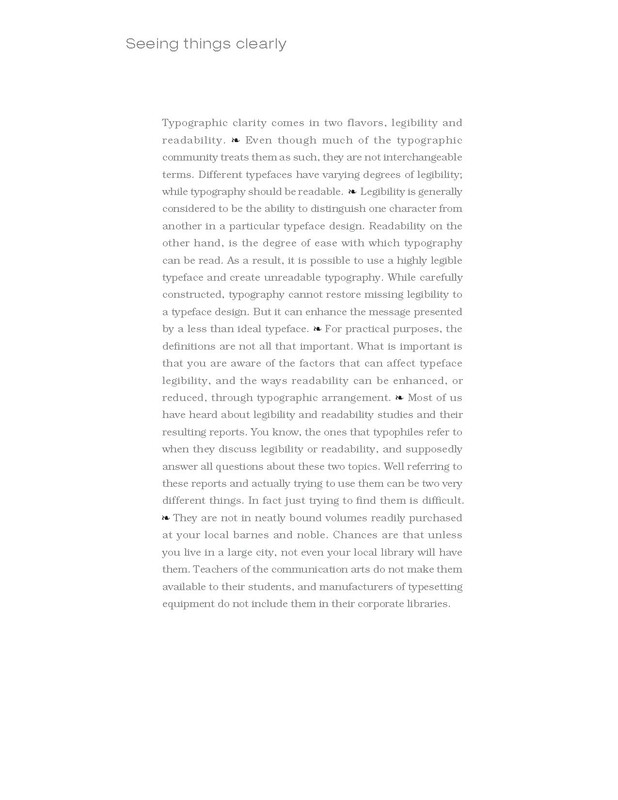 The challenge for the reader is that the type is both small and condensed too. And as with example 2, perhaps there is visual irony here. Because there is no doubt this text is difficult to read.